For all you Sonos users out there, the company has updated its Sonos control app to address some concerns that users had with the previous version. The new version 5.3, which is currently available in beta for Android users, makes it easier to move music between rooms and makes better use of the screen real estate on a tablet, among other updates. The finalized version for both Android and iOS will be available soon. Sonos software update 5.3 brings simpler room control and faster access to all your music in the Sonos app for smartphones and tablets. Android users can try it in beta today. When we launched our new Sonos app last spring, we applied everything we learned from our first ten years to bring you a flexible platform built to take you through all the great things to come in streaming. While we've received a lot of positive feedback for new features like the ability to search across all of your music sources in one place, we also heard from many of you that we made some things worse. It became more difficult to move music between rooms, the Sonos app for tablets did not make good use of the screen size, and some of the smaller features you loved in the previous app were not available (e.g. the track progression bar). • A faster way to manage all the rooms in your home: Effortlessly move your music around your home with a more accessible rooms menu, now available by tapping the top of any screen in the Sonos app. • Improvements to the tablet app: New dedicated screens for what's playing and music discovery on iOS and Android tablets makes toggling between screens more intuitive. • Quickly switch between screens: Using your phone, swipe down from the now playing screen to go back to browse your music. Then swipe from left to right to show all your music sources. • Want to hear that verse again? The track progression bar is back in your now playing screen, just below the album art. Drag it to whatever point in the song you want to play. • Easier to mix it up: With Crossfade, blending your tracks is simple from within the info menu, now more prominently placed alongside the sleep timer. From the now playing screen, press the info button to access. We hope you like where these changes are headed. It is our ultimate goal to bring you the best experience with music at home and you can expect that we'll continue to push toward that with everything we do. 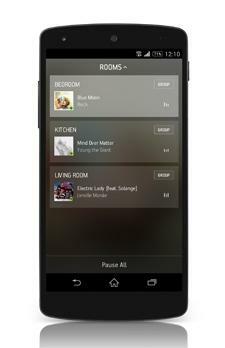 Try what's new by downloading Sonos 5.3 in beta today on any Android mobile device. The full release, including the updated app for iOS devices, will be available in the coming months. • Sonos Playbar Soundbar Reviewed at HomeTheaterReview.com. • Spreaker Now Available on Sonos at HomeTheaterReview.com.